My first foray into competitive bagging came at the age of 19, when the grocery store where I worked held a contest. I was a vision of speed, grace, and—dare I say—beauty, as I deftly filled two paper bags with an assortment of cans, dried goods, and perishable items. My first-place finish qualified me for a far loftier competition: the Southeast Iowa Regional Bagging Contest. The regional bag-off was in the stockroom of a Hy-Vee grocery store. Bathed in the antiseptic glow of fluorescent lighting, the air thick with the musky smell of cardboard boxes, it was far from glamorous. It wasn’t the locale that made my heart sink—it was the competition. Some baggers were twice my age, and they had muscles in all the right places—strong, beefy hands with long, nimble fingers that could handle a two-liter soda bottle with the same ease they would a 12-ounce can. Their arms were thick as nautical ropes, or so they appeared to a scrawny teenager. I was a few years removed from high school, working my way through college by stocking shelves, bagging groceries, and loading cars. Sure, I sat through my store’s mandatory 30-minute instructional video on bagging, but my skills were mostly self-taught. My small stature gave me an edge: My nimbleness made me fast on the draw. By leaps and bounds, I was the quickest bagger in my store. But in the larger competitive bagging community I was still a neophyte up against experienced professionals. As the Southeast Iowa Regional Bagging Contest was about to begin, I discovered something that caused me to panic. It became clear most of my competitors had been “listing.” Their store managers had given them lists detailing the exact groceries we would be bagging that day so they could practice ahead of time. (It’s like knowing the order of the next 50 Tetris pieces coming down the pike.) I was provided no such list. Unfortunately, this story doesn’t end with a Rudy-style heroic comeback. I did not win the Southeast Iowa Regional Bagging Contest. Still, without the competitive advantage of listing, I finished third, enough to earn me praise from the store manager and several slices of free pizza from the deli. Still, my journey up the lower rungs of the upper Midwest bagging world ladder earned me a measure of street cred in grocery circles. So when I rang up 2017 National Bagging Champion Brady Long to talk shop about competitive bagging, I felt an immediate bond. We joked about the lameness of plastic bags, lamented the trend toward self-checkout lanes, and shared a mutual admiration for a perfectly constructed bag of groceries. But if Long could stop them, if he could intervene, what would he say? How would he instruct them to bag their groceries? There are some simple rules. Cans and jars go on the bottom because, well, they’re heavy. As anyone who’s ever played rock-paper-scissors knows, heavy things crush lighter things. No two bottles should touch each other, because glass on glass is a recipe for breakage (or, at the very least, annoying clanking). No can should be stacked atop another can. Even with beveled bottoms, stacked cans tend to topple. Use cereal boxes along the sides of the bag to construct walls. In between, place smaller items like garlic bulbs, Slim Jims, Tic Tacs, and bags of dried legumes. On top, gently place fragile items like chips, bread, tomatoes, and eggs. But that’s just the basics, or as Long puts it, “the common sense stuff.” In reality, next-level bagging requires deep thought. Raw meat does not mix with other groceries, and if it does, you wrap it so it doesn’t leak. No one likes salmonella. Frozen foods should stick together, as should “toxic” items such as toilet bowl cleaner, laundry detergent, and all other cleaning supplies. Refrigerated items should share a common bag as well, if for no other reason than to make your groceries easier to unload when you get home. 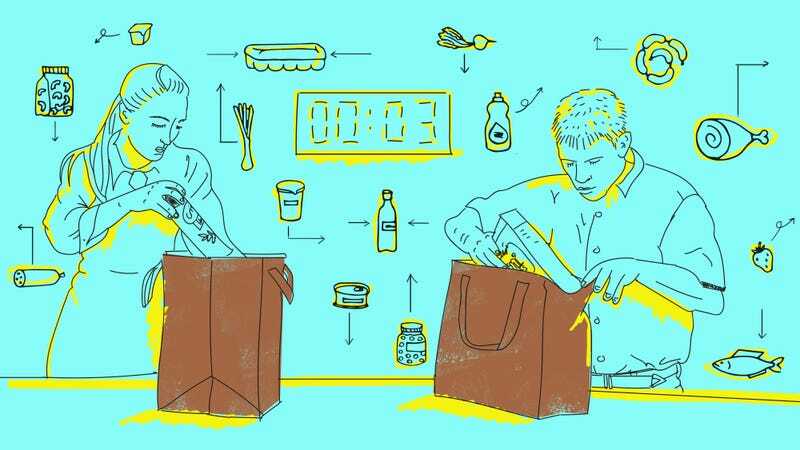 Distribute the groceries’ weight evenly across all bags, to make schlepping them easier. Long certainly is. For his championship, he won $10,000, and was featured on NBC’s The Today Show. Throughout his journey, he abided by his golden rule of bagging: “You just have to think, ‘What would you want the bags to look like when you get home?’” Long said. “You wouldn’t want the bags all sloppily put together. You have to think about the customer.” Especially if the customer is you.